Kids normally start playing guitar and getting into rock & roll to rebel against their parents and stick it to The Man. Santo and Johnny began when they were little boys, at their father’s request. Anthony Farina was drafted into the Army during WWII and sent to Oklahoma for training. While stationed there, he fell in love with the sound of the steel guitar on the country and western stations. He wrote to his wife in Brooklyn and said he’d like their two sons to learn the instrument. 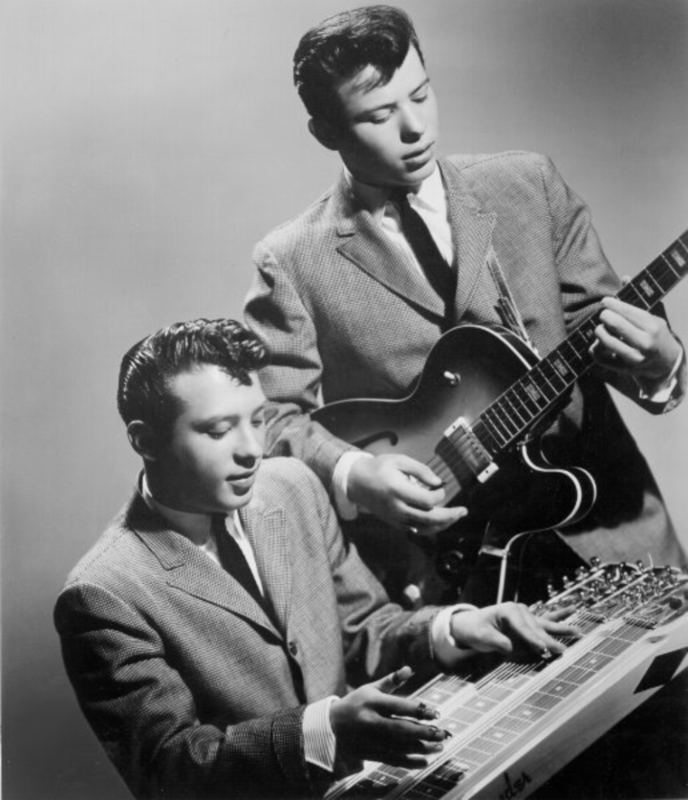 They weren’t even in their teens yet, but Santo and Johnny dutifully went to a local music store and took a few lessons from the owner, who had no idea how to play the steel guitar himself. Upon leaving the Army, Anthony Farina returned home to New York and found the boys a Hawaiian gentleman to give them proper lessons for a few months in exchange for some home-cooked Italian dinners. When their instructor moved back to his home state, Santo and Johnny continued learning the lap steel on their own – by ear, by trial and error, by hook and by crook. Although they’d been playing with others for years, as teens the boys formed a duo and played at local school dances and block parties, sporting a repertoire consisting mostly of covers, as well as a few originals they’d been working on. They recorded a demo of one of these tunes, an instrumental called “Sleep Walk,” and shopped it all over town, collecting rejection after rejection. Their belief that they had a hit paid off when a tiny label finally said yes. 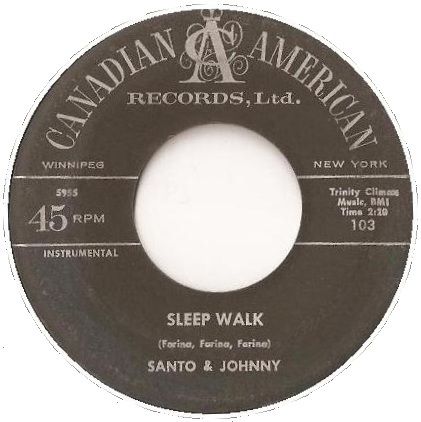 Released as a single in 1959, “Sleep Walk” climbed to the #1 spot and became one of the most successful rock & roll instrumentals ever recorded. All because a father wanted his sons to play the beautiful sounds he heard on the radio. Ah, such a beautiful recording. Glad that Mr. Farina wanted his sons to learn steel guitar! Interesting story behind the song. It is beautiful, isn’t it The song shows up in a ton of movies and I’m always happy to hear it.